The PCC population is overwhelmed by technology. We want to help you navigate technology at PCC. This is why a collaborative venture between the TLC, TSS and a variety of departments who specialize in technology tools and methods is taking place at the Sylvania TLC (CC 223) Fall Term, 2013. Gabe shows off the WordPress Blog Platform that is available to PCC Departments and Programs. We will then have a discussion about how to get a blog and how blogs might be used at PCC to enhance communication. Cool. What if I can’t make it? Can I watch this on YouTube? Sorry Bryan. 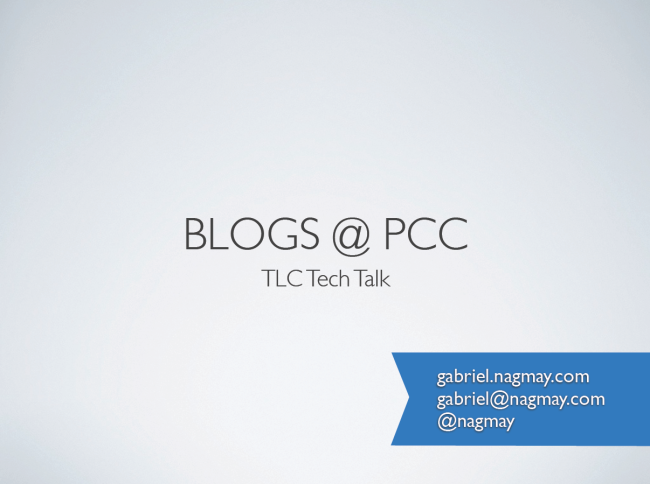 It was “Blogs” at PCC – not – “Vlogs” at PCC.